We do our utmost to ensure our prices are as competitive as can be and carry out weekly 'price checks' to check this is the case. 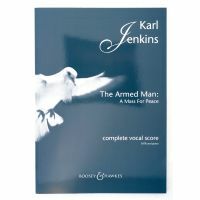 For example, the full vocal score of The Armed Man by Karl Jenkins is £8.99 with us whereas currently £9.09 with Amazon. .... and if you are a 'returning customer' you can use your EXISTING customer discount code to obtain a further 10% discount off our price.